Pure euphoria was felt around the globe as the results of the 2008 Presidential elections were announced. History was made tonight while tears of joy were collectively shed by everyone. Xavier and I joined friends at several places to wish for the best outcome… and we got it! We hung out at rowdy noize club DeRailed and never left there… DJ DaemonChadeau has a way of grabbing you by the throat in a non-stop industrial noize assault. DeRailed was the perfect place for the American spirit. Our country was born from rebels… noisy loud rebels who refused to bend to the mother country. The party was intense as American avies and Europeans joined together to root for change. 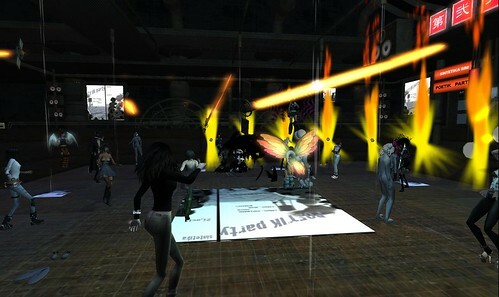 Earlier, I went to see old friends at Divaz and hung out there to see a rare set by DJxHalloween, the best dj on the grid. Many there were speaking about the politics and all were hoping for a Obama victory. 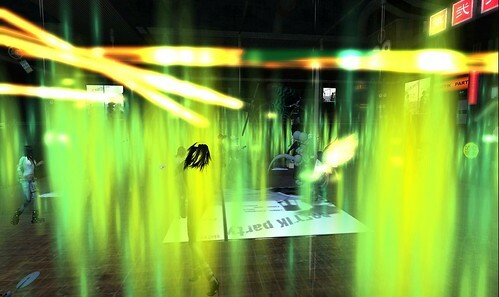 I got a tp from DJ Zap Hax over at R.A.R.E. and he was doing an impromptu party celebrating the election day madness. Zap never fails to create the perfect sets, and it was so grand to be there with the Europeans. I was exhausted from a lack of sleep and excitement, so Xavi and I headed to the beach to relax for a while. We reflected on American politics, the monumental task that faces Obama, and the almost forgotten war. We both hope that people from all affiliations will come together to work for a better and stronger America. God bless us and let us all hope for a better future for our family, friends and country. Yes, we can! Peace and Love to all!